In this episode, I explore dozens of examples of creative people either being limited or exploding the labels that define them. I hope it inspires you to make some changes and take some risks of your own. DANNY: Welcome to art for all, the Sketchbook Skool podcast. I’m your host Danny Gregory. Each week I bring you stories, ideas, interviews and inspiration to keep you company while you work on your own creative project. Whether you are drawing a selfie, carving an ice sculpture, sewing a ball gown, designing an annual report, or making a grilled cheese sandwich, I hope this episode inspires you. That’s our mission at Sketchbook Skool, to help encourage art for all. Including you, of course. I just saw the preview for a new movie . It’s a remake of a remake of a remake of a Star is Born. There were a couple of notable things about this preview; one was that it starred Bradley Cooper and that he was also directing for the first time . That’s not terribly unusual. Movie stars often aspire to direct but what was more surprising was the fact that Bradley Cooper was also singing and playing the guitar in this movie. I mean, hos last movie was the Avengers: Infinity War in which he played a genetically-engineered raccoon-based bounty hunter and never sang a note, And his co-star in A Star is Born was Lady Gaga, who is someone who I think of as a popstar not an actress. Although she was an extra in an episode of The Sopranos called “The Telltale Moozadell“. So it was a situation where we have one person who’s an actor who’s now being a director and being a singer and another person who is a singer who is now being an actor. Now, I’m going to assume that Bradley Cooper was probably in many musicals in high school in Philadelphia and that he has had some training at the Actors Studio drama school in singing and dancing and juggling and what not. The point is that we tend to think of Bradley Cooper as just an actor and there’s inevitably some resistance when he or Emma Stone or Kevin Bacon suddenly came on stage and start to sing. That was Bobby D, covering Polka Dots and Moonbeams from 2016. People still have problems with him stretching boundaries. Creative people are not meant to step out of their boxes. It does seem more okay for non-creative types to go the other direction.You can be come a novelist if you’re a lawyer like John Grisham and Scott Turow or a doctors like Michael Crichton. A couple of my favorite novels in the last few years, Rules of Civility and A gentleman in Moscow were written by a stockbroker, but somehow we have a bit more of a problem when creative go the other way, I think. That’s something we need to ask ourselves about. David Bowie is obviously known as a pop star. I recently went to this amazing exhibition, which unfortunately is now over that chronicled his entire creative life and included references to his acting career, but also to the fact that Bowie was a painter and there were several of his paintings hanging in the show and I have to say they were startlingly good and I had no idea that he was capable of such things. Anthony Bourdain recently passed away. He was a chef, a cook not even a particularly distinguished one and then he became a memoirist, a writer and he was a very good writer and then he became a television personality and an interviewer and a travel chronicler. So again transcending one category to another. Tom Ford was a fashion designer who was the head of Gucci and I remember when he suddenly came out with a film he directed, and I was kind of apprehensive about seeing and for all what is this guy directing movies now I found myself also struggling with such a giant leap. But of course that was ridiculous. The movie was great as are his clothes. Probably the greatest archetype of this in our time is Oprah. Oprah began as the winner of Miss Black Tennessee beauty pageant and then became a news broadcaster. and then a talk show host. Then she was nominated for an Oscar as best actress in the color purple which was a surprise to a lot of people. The she wrote books and started. A magazine, and a TV network and has repeatedly been describe das one of the most influential people of our time. Some [people even wanted her to run for President. she went on and on to transcend categories and to become lots of different things despite the resistance we might have to people breaking these categories. The fact is that when it comes to creative people what we should be focusing on isn’t the form that they’re presenting their work in it doesn’t matter whether it’s a painting or a dress or a cake or a novel. It doesn’t matter whether you’re a TV actor who suddenly in a movie or whether you’re a movie star who’s suddenly in a play. Does it matter what channel you’re expressing yourself in? What matters is the message. What matters is the essence of what you have to say, the part of your soul that you’re revealing, the observations that you have about The Human Condition, the things that you have to say matter more than the form in which you say them and it’s quite possible that you decide that certain aspects of your message live best on the written page, but then you also want to explore what it’s like to sing them what it’s like to build a business around them or what it’s like to express them in any form that you choose. And I think this limitation that labels impose on our feelings about other creative people are even more limiting when we apply them to ourselves and we say, Well, I’m not an artist but I drew this and when we put this limitation on ourselves that says I’m not legitimately allowed to express myself in this or that form. Well, it’s a caveat that we apply that says. I’m not really a singer but I’ d like to sing this song for you. I’m not really a writer but I wrote this poem The labels don’t matter. If you wrote a poem. I guess you’re a poet or maybe you’re not a poet, I don’t care. What I’m interested in is experiencing your art, experiencing your creativity, hearing what you have to say experiencing the emotions that you elicit in me. That is what counts not the label that you think you’re supposed to apply to yourself. And then of course, Barack Obama. A lawyer, a Professor, a Community organizer, but then he won a Pulitzer Prize for his beautiful memoir and then of course he went on to become few other things. Let’s listen to him sing. My favorite creative people have lots of passions. David Hockney designs opera productions, make films, reinvents photography, repurposes fax machines, writes books, oh, and paints and draws too. But because various rich and powerful people like the King of France saw his problem-solving potential, whew was given all sorts of odd assignments. He designed sets for pageants. He developed military technology, he invented flying machines and even a mechanical knight and a steam cannon He made musical instruments,, drew up architectural plans and engineered new types of bridges. Creative people don’t have to fit into uncreative pigeonholes. We can make anything if we have the courage and the time to figure it out. Is success in one field a guarantee of success in another?Was Elvis an amazing actor? Let’s just say he was pretty good. Would I buy an album by Bradley Cooper? Maybe not so much. Does it matter. Not at all. When ever I start doing something new, I am super excited about it. Now, I am a writer. That’s how I have earned a living most of my life. My DSLR camera got me hooked on making videos and Final Cut Pro X got me deep into editing. Last summer I learned the basics of letterpress printing. Cooking, playing the guitar and the harmonica, yoga, anything. I’m super excited about it. It’s new, it’s interesting, it’s limitless, everyone loves that I’m doing it, I am fine with having no skill cause, hey, I just started. From Day One, I am full of visions of what my life will l be like when I am really good at whatever it is. A few weeks into it, the hate begins to dial up. I feel like a fraud and a failure. I know the basics, I get it, but I can’t do it well enough. I’m not progressing as fast as I was, the novelty has worn off, I’m telling myself that I’ll never get any better. And it’s hard so I am ready to give up. I’ll never be a pianist. I’ll never be a pastry chef. Or launch a tech startup. Or win Wimbledon. Or an Oscar. Or be inducted into the COuntry Music Hall of Fame. Sometimes I do give up which is sad and I usually regret it later. I still wish I could play the piano. But then, if I persevere, a few months in, I actually do start to get better. Enthusiasm eventually meets resistance and only with perseverance do you achieve skill and then passion. Don’t mistake this middle period for the end. You will pass through it but only if you work hard and endure. Even after the fumes of novelty have burnt off, you gotta still beaver on. Sorry. It’s all good. Just remember, Passion doesn’t depend on what you do. Just on how you do it. If you’d like to try your hand at something new, I will of course recommend a kourse at Sketchbook Skool. We have a few dozen of them to help you start drawing or painting or making maps or drawing food or designing greeting cards. 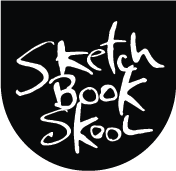 You can sign up at sketchbook.school and start one any time you choose, in between all the other things you are doing, whether it’s starring in a movie, weaving a kilt or playing Mr. Tambourine Man on the ukulele. In his book Outliers, Malcolm Gladwell cites a study by Anders Ericsson, a Swedish psychologist, who claims that it takes 10,000 hours of practice to achieve mastery of a special skill or knowledge, in any field . 40 hours a week for five years, roughly. But that’s mastery. Personally I’m perfectly happy with solid competence. A six week, four week, or even a one weekend kourse at Sketchbook Skool teaches me loads of new things, stretches me in new directions, and gives me a taste of where I could take things if I continue down the road. Well, I hope you enjoyed this little peregrination and found it thought provoking. If you did or if you didn’t, please subscribe and give us some feedback. We try to make lots of different sorts of episodes for you on this podcast and to cover lots of different topics we think you’ll find useful. And we’d love to hear from you so we can make art for all even better. Until next, time, I’m danny gregory and this is art for all. Hellooooooo Danny. You continue to be thought provoking and an inspiration. Tina and I are looking forward to seeing you in Pasadena. Thank you. I enjoyed this topic. I waffle between ‘darn, I’m good at this!’ & ‘I’m not good enough for this to be more than a hobby.’ I’ve saved this to listen to or re-read again.